The mayor of Darby Borough (an exurb of Philadelphia) is pleased. Calm has descended on the town. Calm has descended because she's imposed a curfew – you know the kind of thing we read about in Baghdad, Syria, Gaza and such places. For those of you still surprised to see the sun rise in the east every day I’ll add that Darby is overwhelmingly black. And why the curfew? Guns are causing a problem, according to the authorities. Not, mind you, the people who discharge said guns. Rather the guns themselves. Strange, no? Maybe they should give out different guns, then everything would be ok.
() the 1st Amendment by placing protesters in cages, banning books like “America Deceived II” and censoring the internet. Am I paranoid, or are certain people preparing for certain events for which a disarmed white citizenry is a requirement? The effects of the exodus are being felt by Arizona retailers who are reporting dwindling sales of beer, spray paint, and ammunition. Also hit hard are the states hospitals, which have reported a dramatic decline in births and emergency room visits. Tattoo parlors are in a state of panic. We wish you and yours the very best amigo. A sign of the Great Realignment? For several years I've been keeping an eye out for signs of the Great Realignment in American politics. What I mean is that, as the Democrats increasingly become the party of minorities and white useful idiots, would the great body of whites start to realign with the Republicans? With every other race shamelessly uniting and promoting its own narrow agenda – invariably at the expense of whites – the Great Realignment would be truly momentous. Whites united in their own interests, as distinct from the interests of every other ethnic group, would be unstoppable. Well, we don't expect trend-setting from Alabama, but it’s from this unlikely source that dramatic evidence has emerged. An interesting article over in VDare tells us that not only have the once-hated Republicans taken decisive control of both the House and the Senate there, the parties have taken on a distinctly Great Realignment hue. You see the Republican legislators are all white. Every last one. Not terribly surprising in itself, but you see, the Democrat legislators are mostly black. In the House, the black Democrats outnumber the white Democrats 27-to-12. In the Senate they outnumber them 8-to-4. Is this a straw in the wind which says that the Republicans will become the White party and the Dems the Party of Minorities? Surely too early to say. But if the trend grows, America, and the West in general, could be on the way back. Californian is a regular and welcome commentator on this blog. He responds to a question in another comment to the effect - what should race realists do. Well, here's his response, which to me makes one hell of a lot of sense. There has to be a realistic political program. What is it that race realists want people to to? And do in the real world, not in some hypothetical White ethno-state, but here and now?Some examples:Organize an alternative news media, perhaps via the internet, to broadcast the truth. Hammer home a few issues: high black violent crime rate; high black illegitimacy rates; high black drop out rates. Stay on the offensive, put the multicultists on the defensive. Support groups which are fighting for Western Civilization at home and abroad. This can be anything from joining and contributing some money (always vital in activism) to getting out in the streets and campuses and protesting. Set up organizations which will defend White ethnic interests--counterparts to the ACLU, MALDEF, NAACP, SPLC, etc. Surely there must be race realists who are lawyers or organizers who could do this. Take the initiative and bring legal action against liberal governments, universities, etc., for violations of White civil rights.Get people to stand up and hold a real dialog on race. Since blacks hold Whites accountable for things such as segregation era lynchings (long dead), then they have no right to complain when Whites hold them accountable for their violent crime rates today. Support initiatives to end affirmative action, to end all benefits for illegal aliens, to end all PC indoctrination in the schools. Promote gun ownership internationally for law abiding citizens. This will allow people to defend themselves against rampaging mobs, and also act as a counterbalance against the abuses of the PC establishment. How about an international version of the NRA? Organize a boycott of the mainstream media. If people switched off their televisions, it would end most of the power of the liberal agitprop machine. Promote the defense of White people internationally. Start with White South Africans being subjected to farm attacks. Attack, attack, attack (within the law): start a campaign to brand the multicultists and the PC establishment as traitors. And they are traitors, given the way they are destroying their own countries and peoples. They can dish it out, but they can not take it.It all can be done if race realists act intelligently. What I like in particular about his plan is the exhortation to be proactive, aggressive and unapologetic. This is vital. All of us only respond to attacks and aggression (if we even do that). Take the attack to them. In a post a couple of weeks ago I asked whether things are about to kick off in the US. I cited several links drawn from a single day of the Drudge Report which identified a rash of black on white attacks. I asked whether whites were going to take this lying down indefinitely. Related to this I've been keenly following the reporting of such incidents in the MSM. The bifurcation between the 'journalists' on the one hand, and the commentators on the other, is truly remarkable. The so-called journalists parrot the usual PC blather, ignoring the race issue, while the commentators are almost unanimously at the opposite end of the spectrum, calling it as it really is. Many also take strong exception to the way the MSM covers up the race element of the attacks. Here are some examples of what I mean - there are lots more out there. Thankfully. I chose typical MSM sites, and in the case of the two Chicago items, please revel in the fantasies, lies and squirming equivocations that the 'journalists' deploy to convince their increasingly unconvinceable readers that the sun actually rises in the west. 1: transitive verb: to devastate a city or region by allowing it to be swamped by blacks. "The city has detroited to a jungle"
An item acquired without paying for it whether through normal shoplifting or a consequence of de(t) riot. A few weeks ago I posted a genuine question which provided some great feedback. 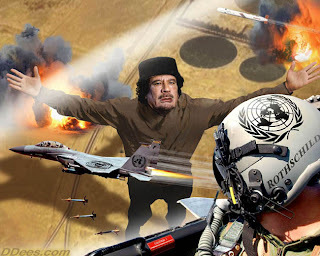 Now I have another: I'm genuinely unsure of the reasons behind the attack on Libya. There are a number of strange features about this For a start, Ghaddafy had come in form the cold and was a really really good boy compared to long ago Then there was the speed with which the decision were made, the widespread support even from the Arab League and African Union, and the enthusiastic support of France and Italy, who normally vigorously oppose such initiatives. And what about establishment of the dreaded central bank in Benghazi with such unseemly haste. Humanitarian: The impulse is to laughingly dismiss this out of hand. But there might be some truth in it. It seems that Samantha Power (who is Irish, by the way) was the main driver for the attack. She is fixated by the failure of the Western powers to prevent the Rwanda massacre. However, American allies in Bahrain and Yemen have been mowing down protestors in even greater numbers. Western oil companies: The very unfavourable terms given by Ghaddafy to western oil companies. Dollar as a reserve currency: Ghaddafy was going to help replace the dollar as the trading currency for oil, thereby accelerating America’s decline. Re-conquer Africa: A ‘spearhead attack’ by the West to re-conquer Africa and forestall the Chinese threat. Dependency and looting: Render Libya dependent on the IMF and other globalist bodies, which would surely result in privatising the country’s assets, a la Russia, with lots and lots of money to be made by the same people. Democratic Party politics: Hillary wants to drag Obama into another land war, thereby giving her a chance for the next Democratic nomination as Barry crashes and burns. What was described as an “impassioned” protest by so-called asylum seekers took place this week in Galway. I say so-called because there is no such thing as a genuine asylum seeker in Ireland. As we have no links to their countries of origin they’d have to pass through a multitude of intermediary countries in order to get here. Ergo, they’re asylum tourists, seeking out the most accommodating prey. Now as you know, and given that some of you have gently chided me in the past, I don't go into crude characterisations of our black cultural enrichers. For instance I never use the ‘n’ word. However, I have to retreat somewhat when describing the leader of the protest, one Kwabena Selby, from Ghana. Quite simply and honestly, if you cut the head off a gorilla outfit and put him in it you couldn’t tell the difference. Be that as it may, he, and his fellow protesters, were not happy with their plight. Now their basic provision is that they’re provided with accommodation, food, clothing, some educational services and health - all courtest of the beleaugered Irish taxpayer. Their accommodation is a former Grade 3 hotel, not luxury, but not bad either. And they’re given €20 per week pocket money by the bankrupt state. So what are their complaints? Apparently there’s restricted access during certain nighttime hours to the self-service kitchen (all food provided free), the pool room and TV services. To add to the ghastly picture, the showers sometimes don't have hot water. And the ultimate indignity, at which they’re seriously pissed off, is that there’s no WiFi access – just ordinary plug-in Internet. How about that! It sure seems to be, as they constantly remind us, a “terrible situation” – and no surprise that they’re “depressed” and that many “cannot sleep”. I can hardly sleep myself thinking about the poor creatures’ suffering.